Silica can help avoiding or alleviating Alzheimer’s disease by preventing the body from absorbing aluminum and may flush out aluminum from the tissues. Silica stimulate the immune system. Defends against radiation poisoning for cancer patients in therapy and over exposure from radiation leaks. can Dosage: Take 1-2 tablespoons per day mixed in some kind of liquid or food. There is no unpleasant taste. Since it will not dissolve, stirring several times while drinking will prevent settling. Some have experienced higher energy levels, so it is probably better not to take it right before sleeping. No worry about getting too much–any excess silica not needed by the body is automatically eliminated through the blood stream, kidneys and intestines. After 1 month, the amount in red parentheses as a maintained daily dose year round. As pets and people get older, they also get sore joints. With DE in their diet they will feel better. Apply to moist kennel areas to reduce odors, dry the area, and prevent pest breeding. Deodorizing and absorption are natural functions of DE, so add to kitty litter to absorb odors and keep the litter box drier. NEVER feed any other type of DIATOMACEOUS EARTH to any animal, other than the Food Grade fresh water DIATOMACEOUS EARTH. 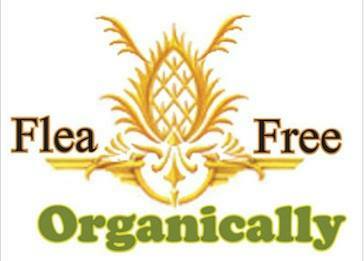 The DE used by Flea Free Organically is superior to what is mined here in the States. It is finer, cleaner and contains more Silica (Calcium Bentonite). Just add 7-10 lbs. of DE to each ton of grain as it is conveyed into the storage. When added to grain, it not only makes it flow better, DE kills the bugs that are present and protects the grain from further invasions. Bugs cannot become immune because they are killed by physical action, not chemical.